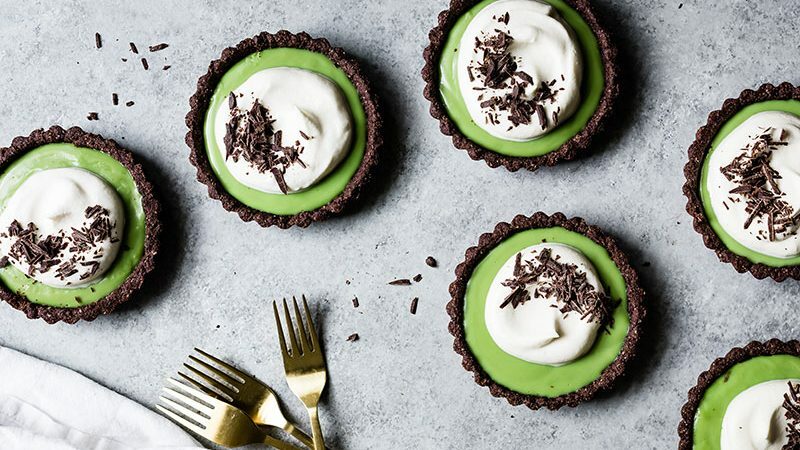 Mini chocolate matcha cream tarts have a matcha pudding filling in a rich dark gluten-free cocoa almond cookie crust (with a bittersweet chocolate shell) and pillows of vanilla whipped cream on top! In the bowl of a stand mixer fitted with the paddle attachment, sift together the almond flour, baking cocoa, oat flour, sugar, and salt. (Alternatively, use a food processor). With the mixer on medium-low, beat until the dough begins to clump and the butter has been completely combined about 3-5 minutes. At first it will be very crumbly, but eventually, it will clump together when pinched with your fingers. If using the food processor, pulse until the dough begins to clump together. Divide the dough into the bottom of size 4-inch tart pans with a removable bottom and begin pressing the dough evenly into the pan, starting with the sides and then moving to the bottom. Your crust should be between ⅛ and ¼-inch thick with the top edges squared off. In a medium saucepan, whisk together the sugar, cornstarch, matcha powder, and salt. Whisk in the milk and cream. Over medium heat, cook, whisking constantly, making sure to scrape the edges and bottom of the pot, until it begins to boil (if you stop whisking for a second, you'll see large bubbles pop up). Continue cooking for 1 minute just to thicken to the texture of a thin yogurt (if you cook it too long, it'll set up very gelatinously). Remove from heat and strain it through a fine-mesh sieve into a heatproof bowl. Press plastic wrap on the surface of the pudding to keep a film from forming and let it cool for 10 minutes. Use a ladle to divide the pudding between the tart shells and chill for at least an hour but up to 2 days in advance. *This recipe was prepared for Rodelle by Sarah at Snixy Kitchen. Visit her site here to read the original post, see more photos, and helpful tips!Check out our how-to video!